L'offre gratuite du jour pour Dimo Videomate 4.1 était valable le 30 avril 2018! Un logiciel de conversion vidéo multifonctionnel pour télécharger et convertir des vidéos 4K UHD / HD / SD vers n'importe quel format vidéo populaire, transformer des vidéos 2D en films 3D fantastiques, réaliser des vidéos personnalisées et accéder à des fichiers vidéo sur un ordinateur local. Transcodage MTS, AVI, MOV, MXF, H.265 (HEVC), etc. pour les appareils mobiles, VR, TV, etc. Coupe la longueur de la vidéo, recadre la taille de la vidéo, ajoute un filigrane de texte, ajuste les effets, crée de la 3D, etc. Téléchargez les vidéos préférées pour une lecture hors connexion. Ajustez les paramètres de sortie en changeant l'encodeur, la fréquence d'image, le débit, la résolution, etc. Un convertisseur vidéo Mac haut de gamme convertit les fichiers vidéo ou audio 4K UHD / HD / SD vers tous les formats populaires, transforme la vidéo 2D en fantastique film 3D, crée ISO, crée des GIF et projette des vidéos sur des appareils ou TV sur Mac. C'est probablement l'antivirus qui bloque l'enregistrement. Essaie de le désactiver pendant 5 minutes par exemple. J'ai eu ce genre de problème à l’installation d'un programme... Bonne chance ! A Marcus, C'est probablement l'antivirus qui bloque l'enregistrement. Essaie de le désactiver pendant 5 minutes par exemple. J'ai eu ce genre de problème à l’installation d'un programme... Bonne chance ! Et une fois de plus !! "Follow the link below to request a free key. Click "Share on Twitter" or "Share on Facebook" buttons. The license key will be displayed on the same page." Ras le bol de ces obligations de suivre les réseaux sociaux pour avoir une clé. Et une fois de plus !! "Follow the link below to request a free key. Click "Share on Twitter" or "Share on Facebook" buttons. The license key will be displayed on the same page." Ras le bol de ces obligations de suivre les réseaux sociaux pour avoir une clé. As requested by the installation process, I shared the info on Twitter. Was then given the following Registration Key: *** which i duly pasted into the "Registration Code" . I then received the following error: "register failed" . I feel like such an idiot now because I did what the company asked and promoted them on my Twitter, only to find that the code is incorrect. Wow... I won't be doing that again needless to say. As requested by the installation process, I shared the info on Twitter. Was then given the following Registration Key: *** which i duly pasted into the "Registration Code" . I then received the following error: "register failed" . I feel like such an idiot now because I did what the company asked and promoted them on my Twitter, only to find that the code is incorrect. Wow... I won't be doing that again needless to say. Marcus, I refuse to shill for software. Why would you promote a program that we never tried? Cheap tweets as these point to a deceptive developer. I'm sure they will make good on your efforts, but this practice is abominable. I'm disappointed GOTD condones it. Marcus, I did not share any info neither twitter nor facebook, what i did is to download the software and use the reg. key you provided above and it worked for me. The key provided works now, this version still has the same build bug as previous ve4rsions where there is no embeded icon for the program in the programs executable so the task bar icon is an ugly windows default no-icon icon. I did report this lazy omission in a previous giveaway of one of their products and it went ignored no doubt it's too dificult for the developer to take the existing VideMate.ico from the program installation folder and embed it into the DimoVideoConverterUltimate.exe file it is not rocket science and would stop the progra looking incomplete and built by an amature! Also be aware that even choosing a unique path for the installation of this program and a unique version specific start menu folder entry will NOT preserve a previous versions installation as the instally silently uninstalls the previous version without warning or notification, you only find out when you go try find it to compare with the new version or revert to the old version if you don't like a change in the new version.Tough luck it's not your computer is it! The key provided works now, this version still has the same build bug as previous ve4rsions where there is no embeded icon for the program in the programs executable so the task bar icon is an ugly windows default no-icon icon. 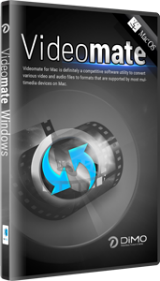 I did report this lazy omission in a previous giveaway of one of their products and it went ignored no doubt it's too dificult for the developer to take the existing VideMate.ico from the program installation folder and embed it into the DimoVideoConverterUltimate.exe file it is not rocket science and would stop the progra looking incomplete and built by an amature! Also be aware that even choosing a unique path for the installation of this program and a unique version specific start menu folder entry will NOT preserve a previous versions installation as the instally silently uninstalls the previous version without warning or notification, you only find out when you go try find it to compare with the new version or revert to the old version if you don't like a change in the new version.Tough luck it's not your computer is it! Seems the only way to get the registration key is via Facebook or Twitter. As I don't have either of these it would appear I'm excluded from being able to tryout today's download. Is there another way to get the registration key?